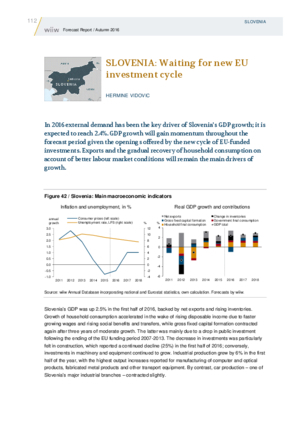 In 2016 external demand has been the key driver of Slovenia’s GDP growth; it is expected to reach 2.4%. GDP growth will gain momentum throughout the forecast period given the openings offered by the new cycle of EU-funded investments. Exports and the gradual recovery of household consumption on account of better labour market conditions will remain the main drivers of growth.